Most ankle arthritis is as a result of what is known as “wear and tear” (or osteoarthritis). Other forms of ankle arthritis exist which can affect the ankle such as inflammatory arthritis (e.g rheumatoid arthritis). When you look at Xrays of the ankle with arthritis, the joint space is narrowed, there are outgrowths of bone (osteophytes) around the joint and the bone beneath the joint surfaces is thickened and dense. These are common features of all arthritic joints and are not specific to ankle arthritis. The inside of a normal ankle joint is lined completely by smooth cartilage which looks very like the covering of the joint one sees with a chicken drum stick for example. The arthritic ankle loses this smooth cartilage lining which normally allows the joint to glide smoothly and in a pain free manner. 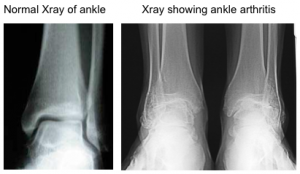 Ankle arthritis is commonly the result of either a direct injury into the joint such as an ankle fracture or the result of longstanding ankle ligament damage. Occasionally it may occur secondary to chronic and recurrent inflammation such as with rheumatoid arthritis, or gout. Most commonly pain is the presenting symptom and in ankle arthritis this is usually localised to the ankle joint and felt deep within the joint. The intensity and duration of pain from an arthritic ankle varies significantly from person to person and at different times. Generally, early symptoms in ankle arthritis are pain and perhaps swelling, after prolonged weight bearing or high impact type activities. If the ankle arthritis progresses then pain can become a more frequent occurrence and provoked by progressively less and less activity. Eventually pain can become present most of the time, even when non-weight bearing or at night in bed. Conservative (non-operative) management can be useful in the early stages of ankle arthritis. Physiotherapy can help by strengthening some of the muscles around the joint but generally ankle arthritis is a difficult condition to treat successfully with physiotherapy. The problem with treating the arthritic ankle with physiotherapy is that the joint is often stiff and painful and the muscles around the joint relatively wasted. All of these factors make improving the situation with physiotherapy alone difficult. Injections of steroid and local anaesthetic into the joint can help for shorter periods of time but tend to need to be repeated. Orthotic (splints or ankle support) management can be very useful for ankle arthritis. This involves both using a rigid plastic splint which runs from behind the calf down on to the foot (an AFO or ankle foot orthosis) combined with the use of a shoe or boot with a stiffened sole with a gentle curve from heel to toe, a rocker sole. A debridement for ankle arthritis is useful in the earlier stages of the arthritic process. It is normally performed as a day case procedure and generally patients can weight bear straight away on the operated ankle. The success rate for the procedure is in the region of 75%-80%. This corresponds to the percentage chance of improvement but not complete symptom resolution. On occasion it can take a number of months before this benefit is achieved. It needs to be borne in mind that there is approximately a 5% chance of significant symptomatic worsening following debriding an arthritic ankle. Before proceeding with ankle arthroscopy for arthritis, it is important to realistically way up the pros and cons with your surgeon. There is a chance that you would need more extensive surgery shortly after this initial procedure if you fall into the 5% group of patients with symptoms getting significantly worse. Ankle fusion involves preparing both sides of the joint back to healthy and bleeding bone. 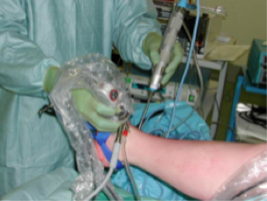 This can be done through arthroscopic (“keyhole”) surgery or it can be performed openly, which means making a bigger incision to prepare the ankle joint for fusion. The arthritic joint lining is removed and the ankle joint is placed in a good position and held there until the bone has grown across the joint and the ankle is thus fused. 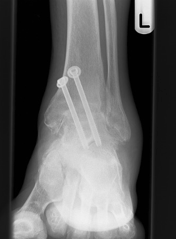 The ankle is held in position whilst the fusion is occurring and this is most commonly done with large screws which are buried beneath the skin. Occasionally a large metal rod may need to be inserted through the heel to compress the ankle and subtalar joints (known as a double fusion). On average it takes at least three months for bone and ankle joint to fuse but sometimes, it can take significantly longer. Diabetes, smoking and poor blood supply in the legs (peripheral vascular disease) can significantly reduce the chances of the joint fusing. Ankle fusion for ankle osteoarthritis is a good option for younger and more active patients. A return to heavy manual occupations and some sports is possible and is largely determined by the mobility of the compensatory joints which are left intact. Ankle replacement involves replacing the two worn out surfaces with replacement highly polished surfaces and adding a high molecular weight polyethylene (“plastic”) spacer between the two surfaces. Ankle replacement generally maintains the range of movement which a patient has pre-operatively. It is not suitable for heavy manual or sporting activities and probably has a ten-year survivorship in the region of 80 – 85%.